Looking for a team building rental item? Consider the Bigfoot Race - people suit up in teams of three to compete against each other. 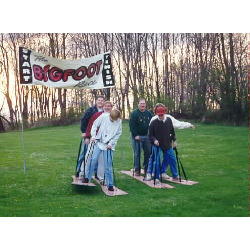 Consider having a racing rental item like this at your next big event to bring out the fun in everyone! It is perfect at schools, corporate events, church festivals or retreats where people will be working teams.